for they could feel your presence in her heart and her holy conversation gave rich proof of it. There have been many "Monnicas" in this world, but none have lived so piously and prayed more vehemently than St. Monnica did for the conversion of her husband Patricius who became a Christian shortly before he died, and then for her son Augustine. When that was accomplished with his baptism at the Easter Vigil in 387 by the great St. Ambrose in Milan she knew that she had achieved her purposes in this life. 'Nothing in this world now gives me pleasure. I do not know what there is left for me to do or why I am still here, all my hopes in this world are now fulfilled. All I wished to live for was to see you a Catholic, and a child of Heaven. God has granted me more than this in making you despise earthly happiness and consecrate yourself to his service' (IX.10). With that she died shortly afterwards at Ostia. Besides the renowned Augustine, Monnica had two other sons, Navigius (who was with her when she died with St. Augustine) and Perpetus. This rare beautiful spirit also had a rather malicious mother-in-law, but Monnica gradually "won the older woman over by her dutiful attentions and her constant patience and gentleness." Monnica's perseverance, that queen of virtues, along with her prayers eventually won her husband as a convert, and he was baptized a year before he died. 'After his conversion she no longer had to grieve over those faults which had tried her patience.' What joy it was for Monnica to know that her husband tasted and saw how good the Lord is, before he died (IX. 9). And what of Monnica as a mother? 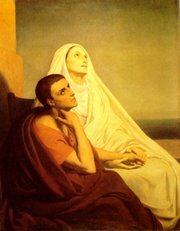 No son has sung his Mother's praises louder than St. Augustine, and one cannot read his Confessions without being deeply moved as he tells of his conversion through his Mother's prayers and grace. As he commented in this remarkable piece of literature he had omitted much as he was 'pressed for time' 'but I will omit not a word that my mind can bring to birth concerning your servant, my mother.' 'In the flesh she brought me birth in this world: in her heart she brought me birth in your eternal light." She served us not only as a mother but also as if she were a daughter to us. She had recognized Augustine's talent as a leader and thinker and encouraged him in his education. She had also enrolled him as a catechumen in preparation for baptism, but he scornfully rejected this and he turned to other philosophies instead. But she bore his arrogance and scorn with the same patience as she had her husband's temper and faithlessness. 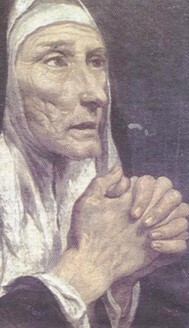 Above all she prayed unceasingly for her son's conversion who related that in his time of adolescent depravity God "rescued my soul from the depth of this darkness because my mother, your faithful servant, wept for me, shedding more tears for my spiritual death than other mothers shed for the bodily death of a son. For in her faith and in the spirit which she had from you she looked on me as dead. You heard her and did not despise the tears which streamed down and watered the earth in every place where she bowed her head in prayer." Monnica was with Augustine in Milan when he was baptised at the Easter Vigil in 387 by Ambrose. After his baptism and shortly before her death she was full of praise for her son. I was full of joy indeed in her testimony, when, in that her last illness, flattering my dutifulness, she called me "kind," and recalled, with great affection of love, that she had never heard any harsh or reproachful sound come out of my mouth against her. But yet, O my God, who madest us, how can the honour which I paid to her be compared with her slavery for me? As, then, I was left destitute of so great comfort in her, my soul was stricken, and that life torn apart as it were, which, of hers and mine together, had been made but one (IX.12). As the day now approached on which she was to depart this life (which day Thou knewest, we did not), it fell out-Thou, as I believe, by Thy secret ways arranging it-that she and I stood alone, leaning in a certain window, from which the garden of the house we occupied at Ostia could be seen; at which place, removed from the crowd, we were resting ourselves for the voyage, after the fatigues of a long journey. We then were conversing alone very pleasantly; and, 'forgetting those things which are behind, and reaching forth unto those things which are before,' we were seeking between ourselves in the presence of the Truth, which Thou art, of what nature the eternal life of the saints would be, which eye hath not seen, nor ear heard, neither hath entered into the heart of man. But yet we opened wide the mouth of our heart, after those supernal streams of Thy fountain, 'the fountain of life,' which is 'with Thee;' that being sprinkled with it according to our capacity, we might in some measure weigh so high a mystery. We were saying, then, If to any man the tumult of the flesh were silenced,-silenced the phantasies of earth, waters, and air,-silenced, too, the poles; yea, the very soul be silenced to herself, and go beyond herself by not thinking of herself,-silenced fancies and imaginary revelations, every tongue, and every sign, and whatsoever exists by passing away, since, if any could hearken, all these say, 'We created not ourselves, but were created by Him who abideth for ever:' If, having uttered this, they now should be silenced, having only quickened our ears to Him who created them, and He alone speak not by them, but by Himself, that we may hear His word, not by fleshly tongue, nor angelic voice, nor sound of thunder, nor the obscurity of a similitude, but might hear Him-Him whom in these we love-without these, like as we two now strained ourselves, and with rapid thought touched on that Eternal Wisdom which remaineth over all. If this could be sustained, and other visions of a far different kind be withdrawn, and this one ravish, and absorb, and envelope its beholder amid these inward joys, so that his life might be eternally like that one moment of knowledge which we now sighed after, were not this 'Enter thou into the joy of Thy Lord?' And when shall that be? When we shall all rise again; but all shall not be changed (IX.10). "On the ninth day, then, of her sickness, the fifty-sixth year of her age, and the thirty-third of mine, was that religious and devout soul set free from the body." Augustine described her death with great feeling. I closed her eyes; and there flowed a great sadness into my heart, and it was passing into tears, when mine eyes at the same time, by the violent control of my mind, sucked back the fountain dry, and woe was me in such a struggle! But, as soon as she breathed her last the boy Adeodatus burst out into wailing, but, being checked by us all, he became quiet. In like manner also my own childish feeling, which was, through the youthful voice of my heart, finding escape in tears, was restrained and silenced. For we did not consider it fitting to celebrate that funeral with tearful plaints and groanings; for on such wise are they who die unhappy, or are altogether dead, wont to be mourned. But she neither died unhappy, nor did she altogether die. For of this were we assured by the witness of her good conversation her 'faith unfeigned,' and other sufficient grounds (IX.11-2). Augustine also expressed how he held back his tears and grief during her funeral. "I did not weep even during the prayers [although] I was secretly weighed down with grief." Afterwards when his grief gave way, he pours out of his soul. I then, O my Praise and my Life, Thou God of my heart, putting aside for a little her good deeds, for which I joyfully give thanks to Thee, do now beseech Thee for the sins of my mother. Hearken unto me, through that Medicine Of our wounds who hung upon the tree, and who, sitting at Thy right hand, 'maketh intercession for us.' I know that she acted mercifully, and from the heart forgave her debtors their debts; do Thou also forgive her debts, whatever she contracted during so many years since the water of salvation. Forgive her, O Lord, forgive her, I beseech Thee; 'enter not into judgment' with her. Let Thy mercy be exalted above Thy justice, because Thy words are true, and Thou hast promised mercy unto 'the merciful;' which Thou gavest them to be who wilt 'have mercy' on whom Thou wilt 'have mercy,' and wilt 'have compassion' on whom Thou hast had compassion. May she therefore rest in peace with her husband, whom she obeyed, with patience bringing forth fruit unto Thee, that she might gain him also for Thee. And inspire, O my Lord my God, inspire Thy servants my brethren, Thy sons my masters, who with voice and heart and writings I serve, that so many of them as shall read these confessions may at Thy altar remember Monica, Thy handmaid, together with Patricius, her sometime husband, by whose flesh Thou introducedst me into this life. May my mother's last entreaty to me be granted in the prayers of the many who read my confessions more than through my prayers alone (IX. 13).